from the Coalition of Immokalee Workers left Mexico at age 14 to work in the fields in the US, and ha s used hunger strikes and labor camps to bring large fast-food restaurant chains to the negotiating table to end modern-day slavery. Christine Loh, from Hong Kong’s environmental group Civic Exchange, discussed how the US should set a sustainable example while China develops. Naomi Klein, author of The Shock Doctrine: The Rise of Disaster Capitalism, examined the implications of the $700bn bailout plan, and Congressmembers and average citizen’s responsibility in regulating our newest acquistions, the financial institutions. Among these agents of change, Rebecca Moore from Google Earth Outreach flew people over the Santa Cruz Mountains, where she used Google Earth to stop a logging proposal in her neighborhood. She then flew over Appalachia, where you can look at Appalachian Voices' historical imagery of the mountains and compare it to how the mountains look today. Coal mining companies have blasted up to 800ft off the tops of the mountains. It's pretty shocking if you haven't seen it before, and now everyone can see it in Google Earth. See it for yourself here. 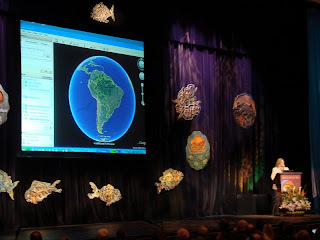 In the afternoon, Google Earth Outreach presented on two panels: the first dove deeper into Appalach ian Voices' use of Google Earth and Maps with Mary Anne Hitt, the Executive Director of Appalachian Voices, and showed how Sylvia Earle, Founder of Deep Ocean Exploration and Research (DOER), has used Google Earth for marine conservation. John Gardiner also discussed the development of the Dreaming New Mexico visualization project, done in collaboration with Bioneers, Peter Warshall, Chantal Foster and Alex Sielicki. The second panel featured the Neighborhood Against Irresponsible Logging group, who are celebrating their recent win, defeating a logging proposal in the Santa Cruz Mountains. Stay tuned for an update about the post-workshop intensive training session where public benefit groups are learning to use Google Earth and Maps to make the world a better place. 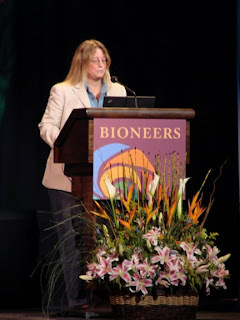 Sunday’s plenary sessions at Bioneers brought more people from all over the globe into one room to collectively vocalize the issues they’re most passionate about. Lucas Benitez from the Coalition of Immokalee Workers left Mexico at age 14 to work in the fields in the US, and ha s used hunger strikes and labor camps to bring large fast-food restaurant chains to the negotiating table to end modern-day slavery. Christine Loh, from Hong Kong’s environmental group Civic Exchange, discussed how the US should set a sustainable example while China develops. Naomi Klein, author of The Shock Doctrine: The Rise of Disaster Capitalism, examined the implications of the $700bn bailout plan, and Congressmembers and average citizen’s responsibility in regulating our newest acquistions, the financial institutions. Among these agents of change, Rebecca Moore from Google Earth Outreach flew people over the Santa Cruz Mountains, where she used Google Earth to stop a logging proposal in her neighborhood. She then flew over Appalachia, where you can look at Appalachian Voices' historical imagery of the mountains and compare it to how the mountains look today. Coal mining companies have blasted up to 800ft off the tops of the mountains. It's pretty shocking if you haven't seen it before, and now everyone can see it in Google Earth. See it for yourself here.